In retrospect, a bright orange shirt isn’t the best thing I could have worn to blend into the background behind the bar as Mike Amidei, a bartender and the beverage manager at Tørst in Greenpoint, Brooklyn, edges around me to serve the early crowd. At 4 P.M. on a Thursday afternoon, there are eight people at the bar: a man working on a computer, a couple that mostly keeps to themselves, and a group of friends spread out across the seats at the middle of a bar, celebrating a birthday. The first time I visited Tørst, I bypassed the packed bar completely, and instead headed into the Michelin-starred restaurant tucked behind the hexagonal door at the end of the room. At the prix-fixe dinner at Daniel Burns's Luksus, I took turns tasting beers from the pairing my boyfriend had opted for—at a $45 price tag, I couldn't justify the stouts, ales, and lagers I barely understood. After the meal, it took only one glance at the bar, Tørst's, rotating menu of lambics, Berliner Weisses, and imperial stouts to realize that I was in over my head there too. But curiousity ultimately got the best of me (it often does), and it didn't take long for me to track down the co-owner, Jeppe Jarnit-Bjergso's, email and skirt my way around to the other side of the bar. I had spent the several months leading up to the email frequenting a craft beer store by my apartment and had developed a little bit of knowledge to support my love of beers (which had previously been limited to a general understanding of the concept of an IPA), so at least this time I wouldn't be completely in the dark—and was filled with questions to ask. Left: All of Tørst's beers are poured in wine glasses; Right: The bar is co-owned by the founder of Evil Twin brewery. The line of taps in the wall behind the bar—21 in total—is impressive in itself, regardless of the beers they hold (which, for the record, are also very impressive—or so Sam, the editorial team's resident beer aficionado informed me before I left the office). 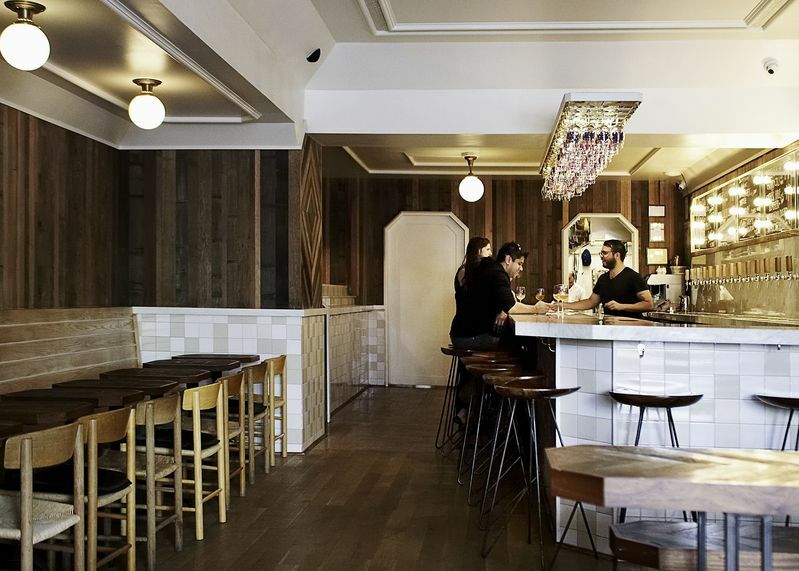 They’re drilled into a gray-veined marble backboard—the same used at the bar—with a simple wooden handle that corresponds with the decorative wooden panels that line the entire room. The wine glasses hang from a back-lit holder above the bar. 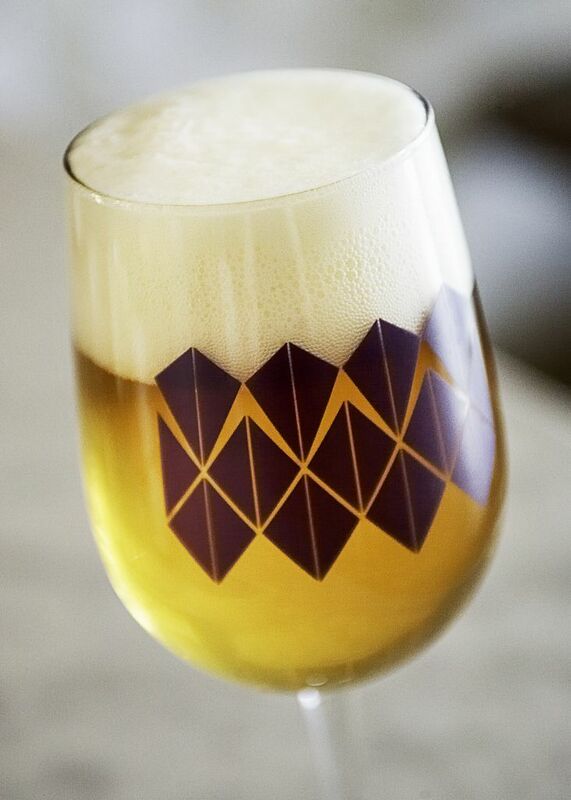 Mike explains, “Wine glasses are a great all-purpose glass, and short of having the specific glasses that pair with each beer, the glasses work the same for beer as they do for wine.” The shape of the glass, he says, ensures that the beer hits your nose and palate. He returns to the couple at the end of the bar, and as he does, he pulls a glass down, rinses it out, and pours a Rodenbach Flemish Red from a tap in the center of the wall. The taps, Mike explains, are organized from light to dark or heavy. The first 14 lines include things like IPAs (today’s is an Evil Twin American IPA) and pale ales (like a Rothhaus pilsner) and are piped up from kegs in a refrigerated room, while the remaining lines (mostly imperial stouts with some dark ales and porters) are held in a room that’s a little cooler than cellar temperature, at 55° F.
Mike says, “Most bars will serve all of their beers at the same temperature, so that for these darker beers, you won’t even really taste them for the first 10 to 15 minutes—and by that point they’re mostly gone.” The separate rooms and their corresponding distinct temperatures allow each beer to be served at the precise temperature at which it will taste best. Each of the beers, which are frequently swapped out for new brews, are also adjusted for carbonation using a machine housed under the taps that looks like a time machine, and is aptly named the Flux Capacitor. 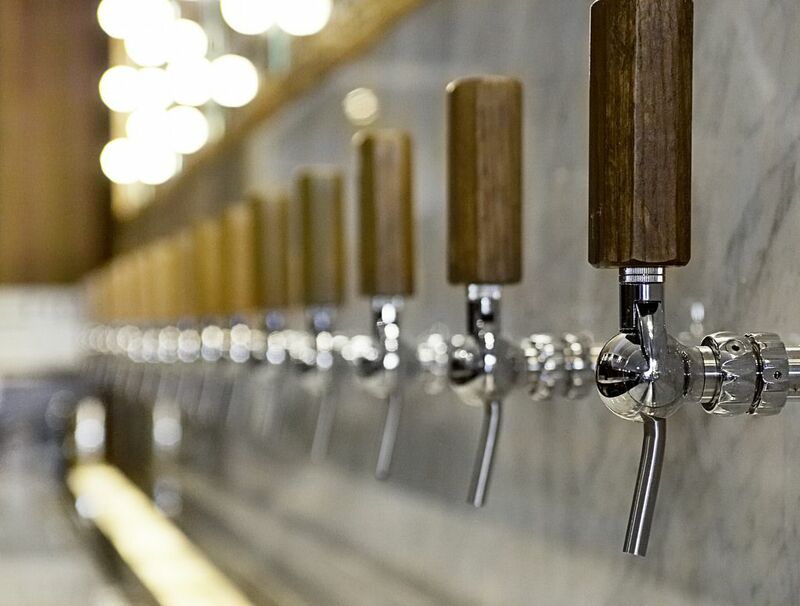 Each tap has a restrictor nozzle on it, which the bartenders use to control the flow of beer. Mike explains that many beers are over- or under-carbonated by the time they leave the brewery and arrive at bars, depending on the length of time since the beer was brewed, the way it was stored, and the yeast in it (beers like Brett Saisons are particularly volatile because the strain of yeast in them continues to eat the sugars in the beer once it’s been kegged, which can make it over-carbonated by the time it’s delivered). The Flux allows him and the other bartenders to adjust the carbonation in each beer by turning a knob that releases carbon dioxide into the beer to pressurize it. 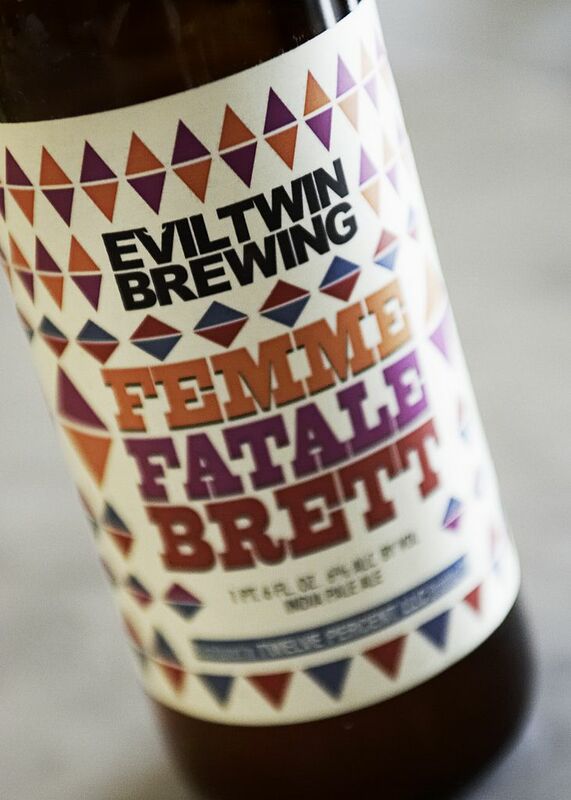 More: For those who enjoy friendly competition, here's what happened when we pitted Evil Twin against Mikkeller beer. An older couple from Wisconsin (the tourist half of the equation) sit down and order a pilsner and an imperial stout sourced from the Icelandic brewery, Borg. This is how it is for most of the customers: They sit down, take a look at the menu, then order. Many of them seem to already recognize most of the beers (though there are descriptions on the menu to help guide them, like “Berliner Weisse with olives and strawberries.”). For those who aren't immediately able to grasp the nuances of every artisinal brew, Mike helps guide them to their decision. Mike pours eight ounces of the ale, over half of which is topped with head. He says that foam is one of the biggest misperceptions about beer: “At bars, people always assume that when there’s more head, the bartender is trying to rip them off, but as long as the beer itself reaches the pour, you actually want your beer to have a lot of head.” He explains that the nose (or the smell of the beer) from the foam is more pronounced (“As long as head is there, there is active scent.”) and that it’s like a base layer on top of the beer. It saves everything underneath, protecting the flavor and carbonation of the beer. He says that the head is the reason he rinses the glass out before each pour—the dust and errant detergent in the glass can eat away at it. 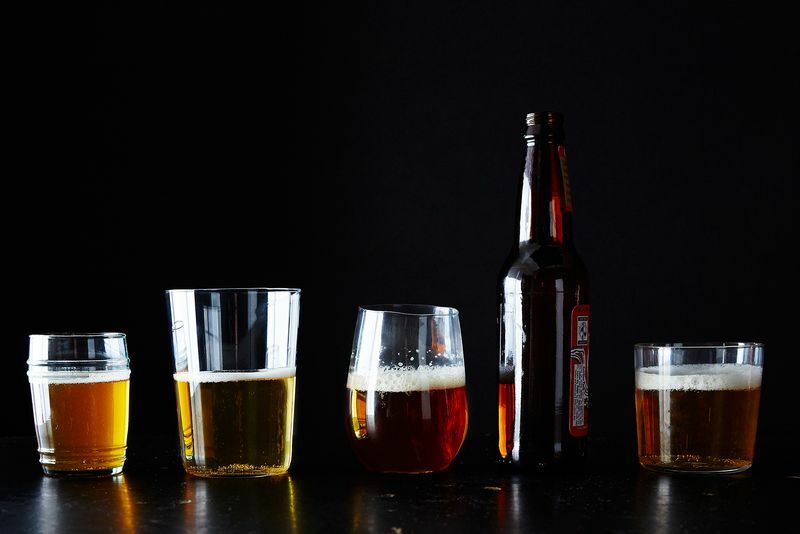 “If you see clumps of foam in a glass rather than an even head,” he says, “it can mean that the glass wasn’t cleaned properly.” Mike adds that at home, people often tilt the glass to pour the beer, but that home drinkers should pour more aggressively—yes, you’ll lose some carbonation, but the fact that the foam protects the beer from oxidization is worth it. By six o’clock, as Mike predicted, the bar is filled with after-work locals, and Graham, the second bartender (there are always two in the evening when the bar gets busier) arrives, so Mike and I duck in to Luksus for “family dinner”—one of Mike’s favorite perks of the adjoining restaurant. When we join Graham back out at the bar 10 minutes later, he’s already read my Food52 bio—he’s been referring to me as “Leslie, if that really is your name” since I came in, but I think that means we’re getting along. By seven o’clock he’s shared some salted watermelon with me and I’ve approved of his switch from a Best Coast-heavy playlist to 80s tracks, so we’re on good terms. Before I head out for the evening at around 7:30—the end of my day, but the start of theirs—I pull up a stool on the other side of the bar and ask Mike for whatever he recommends. He pours me one of his favorites, Evil Twin’s James Beer, the strawberry sour Berliner Weisse, and it’s delicious. After a conversation with a (very Brooklyn) coffee roaster, I hand Mike my credit card, and he hands it back with a receipt that reads $0.00. “That’s your end-of-shift beer,” he says. Since my visit, I've not yet made good on my promise to come back for their more boisterous hours (tell Graham and Mike I'll be there soon! ), but that isn't to say I haven't been under Tørst's influence—I realized it the other day when I poured myself a stout. Not only did I select a wine glass for the dark beer in lieu of a Mason jar, but I didn't tilt it while it poured, and let it come to temperature before taking a sip—and maybe it's just my imagination, but I could have sworn it tasted better.